Black Ice Software - Tiff Viewer version 11.47 is released! Tiff Viewer version 11.47 is released! New support for opening and saving PNG images, and stability improvements for OCR, Text Note, Text Annotation and View Modes! Black Ice Software has released version 11.47 of the Tiff Viewer. 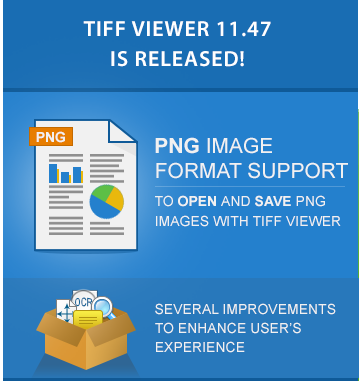 This version includes new support to open and save PNG images in the TIFF Viewer and allows users to take advantage of the PNG image format; the most commonly used image format on the Internet. The new PNG image format support is also included in the MSI installer to allow Administrators and System Integrators to associate the PNG images to open with the Black Ice TIFF Viewer by default. The latest released of TIFF Viewer version 11.47 also includes several improvements in the functionality in addition to improvements on the user interface to enhance user's experience.